While my wife holds down the home front, I’ve been gallivanting around Colorado in the middle of the night photographing the Milky Way. While I don’t like losing out on sleep, I do hold special those times I am alone under a night sky in a place free of light pollution. The sense of awe and reverence come over me, and I do my best to capture the beauty of the Milky Way. A few days ago I awoke at 1:45am, drove a little over an hour to the top of Trail Ridge Road in Rocky Mountain National Park, and enjoyed an hour of dark skies and calm winds. At this time of year (June), about 3:45am, the Milky Way rises nearly straight up from the southern horizon, making for great photographic opportunities. I was able to shoot from several locations in RMNP, including from the top of Trail Ridge Road near the Lava Cliffs, and again from Lake Irene. For Milky Way images, I use a star tracker, a clever little device in which I mount my camera. The tracker does what it says – tracks the stars as they roll across the night sky – thus allowing for long and crisp exposures. I was able to take three horizontal images, each focused a little higher in the sky than the previous shot, then merge them together to create a vertical panorama. The result provides Milky Way images that can go seven or eight feet tall and make for beautifully detailed prints of the night sky. On a few other occasions this past week, I’ve shot the Milky Way in the late evening when it is more of a horizontal orientation – once up in RMNP and another over Lake Dillon Reservoir. Needless to say, I’m dragging now and in need of sleep. But I’m also trying to take advantage of clear skies, little to no moon glow, and unusually calm winds atop Trail Ridge Road. 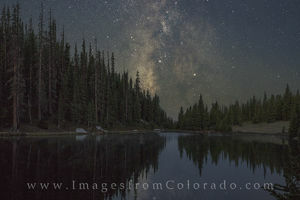 If you have any questions about these photographs of the Milky Way over Colorado, please do not hesitate to contact me.